Very pleasant. A whisky to drink, you do not have to spend a long time verriechen. You can also just leave it out. Fruity, subtle sherry influence. Alcohol stings a bit uncomfortable. Fruity taste with a good start. the alcohol pushes nicely here without disturbing. Unfortunately, not much else happens. Various fruits without counterpoint. Barely sweet, barely oak, barely vanilla. Medium long and .... fruity. Very pleasant Glenmorangie. Easy-drinking, with a good balance. Sherry influence is easily recognized. A good choice for those who doesn't like peated whiskies. 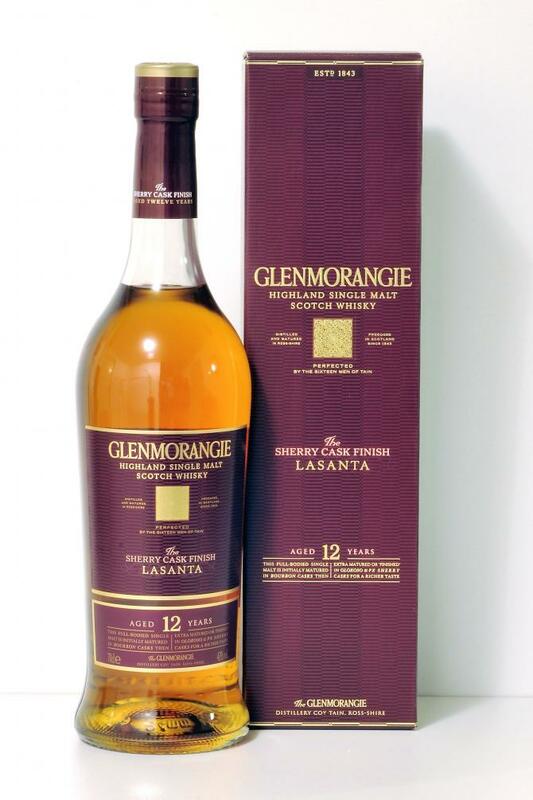 Glenmorangie Lasanta is the 12 year old, Sherry cask finished, bottled at 43% ABV. It first matures in bourbon casks before being moved over to Oloroso and Pedro Ximénez Sherry casks for a finishing period. Lasanta appears with sweet notes of raisin, dried fruits, Christmas cake, apples, polish, spices, stewed apples, ripe fruits and oak. The palate is sweet with raisin, dried fruits, spices, pepper and oak notes. The long finish goes with spices, oak, dried fruits, vanilla notes. It’s sweet, dry and spicy. 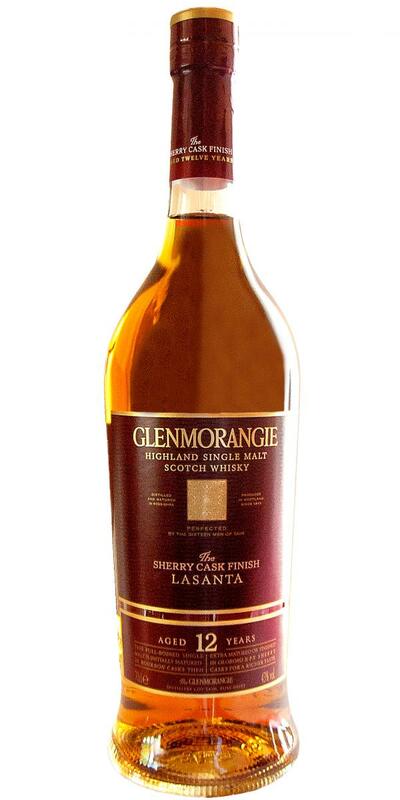 Lasanta is an interesting and sweet whisky with noticeable bourbon and sherry casks notes. It’s a good whisky for sweet-tooths. Surprisingly brash (even a bit hot) for the usually-smoother-than-smooth Glenmorangie brand. Too much sticky, sickly sweet PX influence, though, which spoils the fun once it hits the tongue. The nose becomes darker and more richly sweet with time. When I first opened the bottle, too much time would bring an alcohol burn to the finish, but after about 3 weeks and 1/3 of the bottle finished, that stopped . The development of the taste is moderately paced, but picks up toward the finish. It fades slowly from the oak and sherry tannins for about a minute. I liked the Quinta Ruban, but this one has a much more amenable character. Tangerines and faint roasted almonds, dark chocolate covered raspberries, dates and malt, baking spices (clove, cinnamon, and corriander) and brown sugar, soft oak and oak char, mixed apple compote (fuji and granny-smith) and lemon with zest, and candied ginger. Soft oak, a dash of spiced honey, olorosso sherry (dark fruits and tannins) and citrusy malt, slightly fermented dried fruits (figs, dates, and papaya), heavily spiced baked apples, a dash of walnut oil, and a touch of violet candies. Tart green apples, dark-chocolate covered espresso beans, faint black pepper, and a mix of oak and sherry tannins. I am really positively surprised by this Glenmorangie. With great vanilla, nut, chocolate and exotic fruit flavors, the malt has much more to offer than the relatively unspectacular data suggest. Especially in view of its price range, I can only recommend this malt! A nice interplay of pleasant sherry and ex-bourbon notes is evident even in the first nose. Exotic fruit notes (honeydew melon, kiwi), sweet honey waffles, soft nut nougat aromas and typical raisin notes are created on creamy vanilla flavors. With a little oxygen, the creamy vanilla notes are a little more present and complemented by fruity-spicy white wine aromas and nutty latte coffee aromas. Both the exotic fruits as well as nutty vanilla notes and some latte are also found here. In addition, there is a distinct chocolaty oak, but it comes along extremely soft. Now also develops the typical spice of the European oak (clear dark chocolate and pleasant coffee roasting aromas). In the end, besides the oak, a lot of vanilla and sweet-and-sour kiwi aromas are left in the mouth.